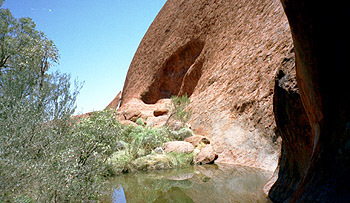 The history and law of the Aboriginal people of Uluru, who call themselves Anangu, comes from the stories of the creation time (Tjukurpa), when their spirit ancestors arose from the earth and travelled all over central Australia, creating mountains and rivers, fighting battles and hunting for food. These spirits were sometimes in the form of animals and birds, sometimes human, and sometimes capable of changing from one to the other. The Anangu pass these stories, and the wisdom they contain, on to their children and grandchildren as they have done for generations. Some of the stories are known only to fully initiated men and women and take a lifetime to acquire, but others (like the one below) may be told to the uninitiated. To many of us, information must be written down in order not to be forgotten, but for the Anangu the opposite is true. Knowledge held in the head and the heart can never blow away or be dropped in the dust and lost like a piece of paper. A web page is as ephemeral as paper, perhaps more so. But I would like to share the following creation story, which I heard from Jacob Puntaru; and more people may read it here than I could ever tell it to using the spoken word. The Anangu are familiar with the internet, as they are with books, and do not object to their stories being passed on using these new-fangled methods if it fosters understanding. 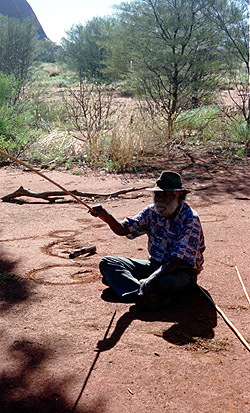 The blue-tongued lizard man, Lungkata, came to Uluru from country to the north. He had stopped at Kata Tjuta, but was lonely and continued to Uluru because he had heard that there were many other beings there and that the land was good. After hunting for food, he looked around for somewhere to make a home. High up on the face of Uluru, to the west of the waterhole at Mutitjulu, he spied a cave, and climbed up the rock to claim it for his own. Panpanpalala moved on, but soon came upon the unmistakable signs of the skirmish that had taken place when Lungkata killed the emu. Realising he had been tricked, he doubled back and followed the tracks of Lungkata, who by now was carrying the emu meat back to his cave  dropping much of it as he went. The story above is a very abridged version of that told to us by Jacob Puntaru. However, there are many variants of the tale. For instance, in some accounts Panpanpalala is not a single crested bellbird, but two brothers. Our interpreter, Darren, who translated Jacob’s Pitjantjatjara language into English for us, wryly pointed out that Jacob himself often varies the details of the story  partly to keep it fresh, and partly to check that Darren really is listening and not simply reciting the story from memory! Jacob stressed, however, that the important thing is not the precise details of the story, but the lessons it teaches  and these never vary. Lungkata is punished not only because of his dishonour in killing another hunter’s wounded prey and stealing it for himself, but also because he lied about his actions. The landscape around Uluru, and the rock itself, is full of the relics and marks left by the ancestral beings and their deeds, and these are used to illustrate the stories. Not only is Lungkata’s cave, for instance, visible to this day, but so are a series of large holes that are his footprints zigzagging up the rock, and a cluster of boulders that are his broken body and the dropped pieces of meat. Most evocatively, an iridescent grey-green trail running down from the cave shows where the lizard’s burning, scaly flesh stuck to the rock as he rolled down. To the Anangu, the stories are understood as real, not mere fables. When they say that a particular boulder is the body of one of the ancestral beings, for example, they do not mean that it represents the body  they mean it is literally the petrified body, immortalised where the being fell  mute testimony to the origins of the oldest continuously maintained culture existing anywhere in the world.